I’ve always been a big sports fan. I love that one gets to experience a full range of emotions, from the ecstasy of victory to the agony of defeat. Growing up in Argentina, I became a huge River Plate fan. I’m also a big Argentina National Team fan. I still remember vividly how I was depressed for about a month after they got knocked out in the first round of the 2002 World Cup. I didn’t want to talk to anybody, and would not pick up my phone. When I moved to LA in 1996, I instantly became a Lakers, Kings and Dodgers fan. My relationship with the Kings, however, started a couple of years before that, when I played EA Sports’ NHLPA Hockey 93 on my computer in Argentina. I didn’t know anything about hockey back then, except that it seemed similar to indoor soccer. 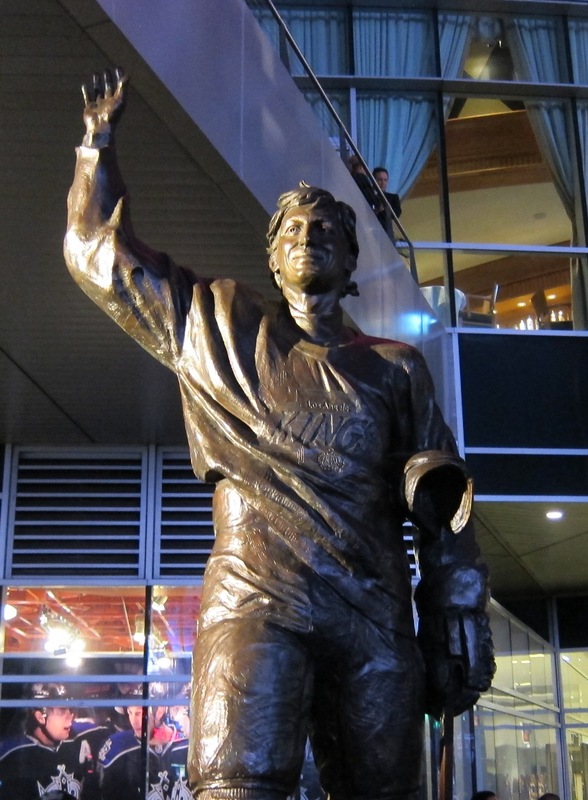 For some reason I picked Los Angeles as my team in the game, and it wasn’t because Wayne Gretzky was there. I had no idea who he was. 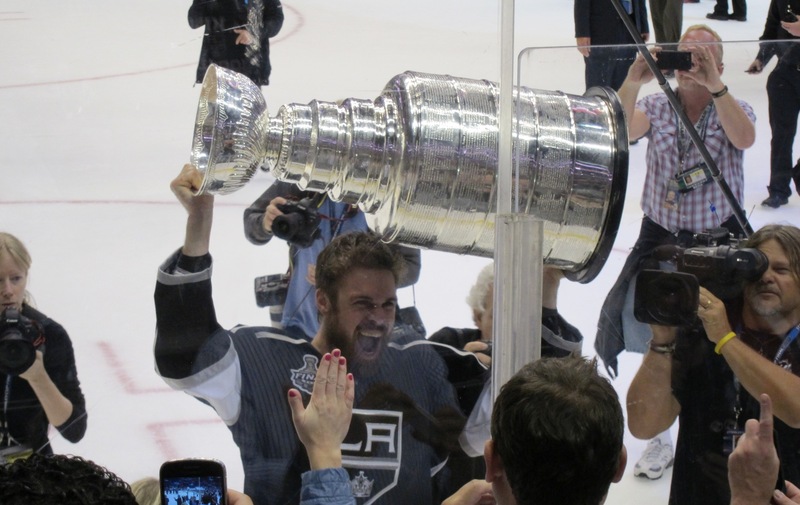 Of the 16 years I’ve following the Kings, they have been pretty terrible most of the time. They’ve always been the underdogs, and my expectations for them were low. 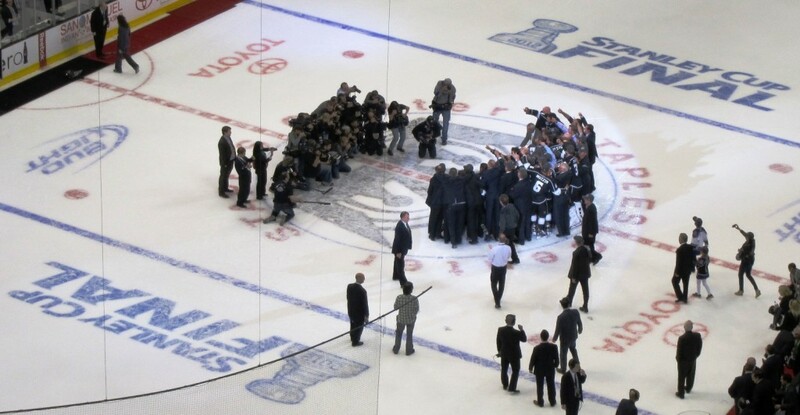 I never expected them to win the Stanley Cup. The first time I saw them live was the year when the Staples Center opened, in 1999. 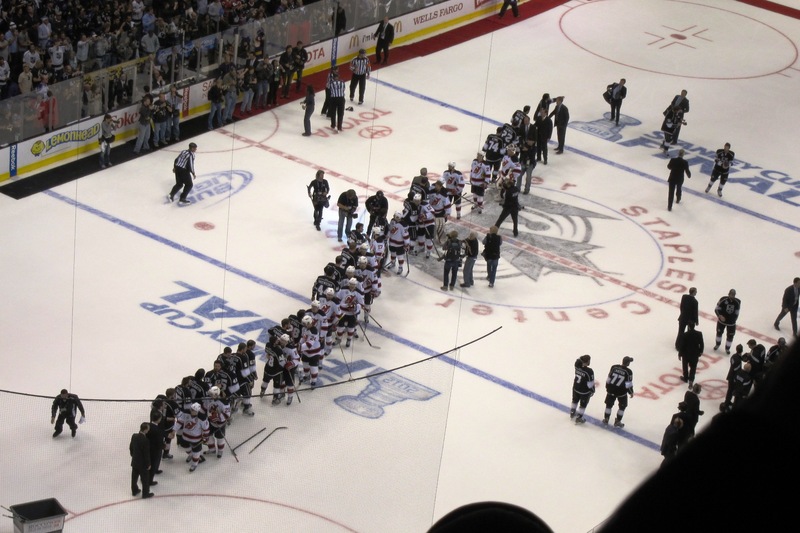 It was a 5-3 victory over the Pittsburgh Penguins. I barely watched any games from 2005 to 2009, although I’d always check the scores. Before that I would watch 60-70 games on TV each season. In 2009, I decided to re-commit to them and started to follow them very closely. I definitely did not expect them to win the cup this year, specially since they almost missed the playoffs despite having played very well in the last 2 months of the regular season. They won the first 2 rounds of the playoffs easily. 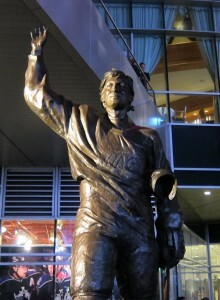 I attended Game 3 of the Western Conference Finals against the Phoenix Coyotes with my friend Elvis. It ended in a 2-1 victory. Their whole playoffs this year seemed surreal. After they clinched that series, I told Elvis that we should try to attend all 3 home games for the Stanley Cup Finals, thinking that each ticket would cost around $200. I mean, how often does one get to experience something like this? The Kings, in its 45 year history, had only been to the finals one other time. 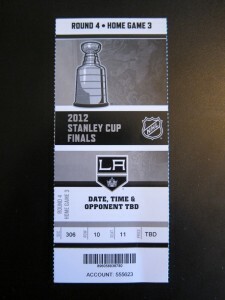 Little did I know that the tickets were almost impossible to get at face value. There was a lottery and only 30 winners got the chance to buy tickets on Ticketmaster. 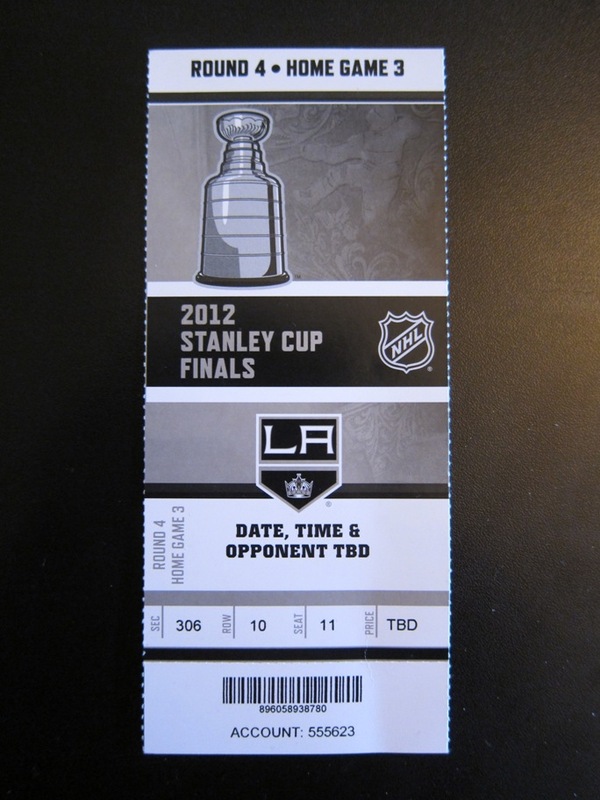 While I was able to get $160 tickets for $120 for the Conference Finals on Stubhub, the cheapest Stanley Cup Finals tickets for Game 4 were reselling for $900+. The Kings won the first 3 games of the series, and Elvis and I went to Staples Center for Game 4, hoping to maybe get some cheaper last minute tickets. We couldn’t get any. Our Plan B was to watch the game on the big screens outside LA Live (the complex next to Staples Center). We had no idea that they were not going to show the games to prevent possible rioting. So we rushed to a bar a few miles away (all the bars around the area were packed and had long waiting lines). The Kings lost, and then lost the following game in New Jersey as well. 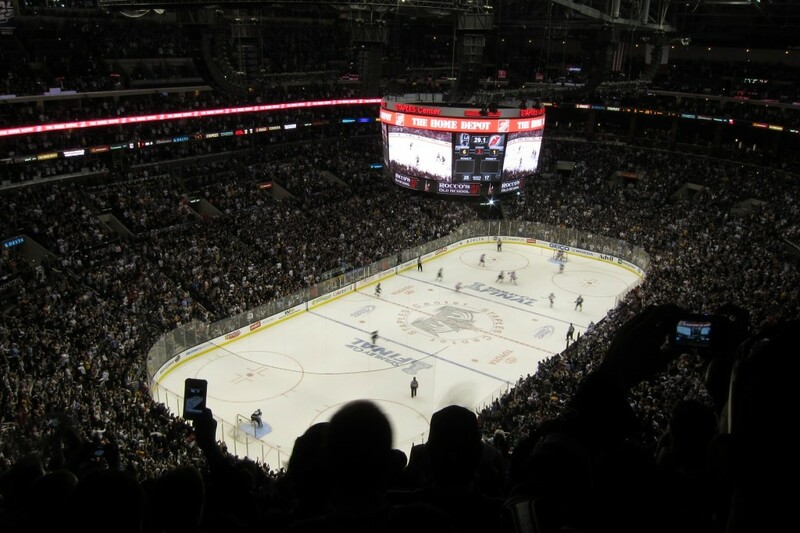 I had given up on the idea of going to any Stanley Cup games. I really wanted to be there in person, but spending $1,000 for pretty much the worst seat in the house just didn’t make any sense. The day before Game 6, I checked on Stubhub again and was very surprised that the prices had gone down considerably. They were still very expensive, but now at least I could try some illogical rationalization, whereas I couldn’t even do that for Game 4. I pulled the trigger the morning of the game and spent the hours before game time with great anxiety. 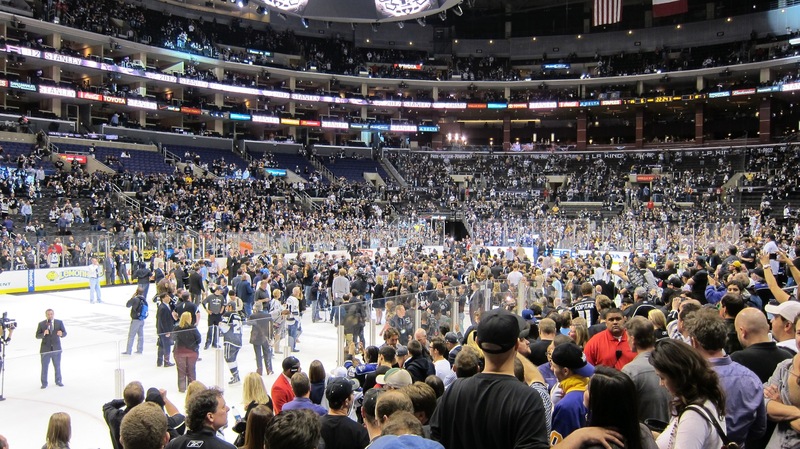 Elvis and I arrived at Staples Center and couldn’t believe that unlike Game 4, we were actually going to enter the building, as opposed to just enviously watch other people do it. Our seats were on the last row on the upper level, but we didn’t care, we were just happy to be there. I thought before the game that it would be nice to get a 2-0 lead in the first period and just easily cruise to the end. Well, they ended the first period up 3-0. We missed the 4th goal at the beginning of the 2nd period while walking back to our seats after getting some beer. I was very nervous the entire game, and was so restless that I remained standing up most of the time. At least there was nobody behind me so I wasn’t blocking anyone. Looking around, I noticed that most people in the last row also remained standing up for most of the game. 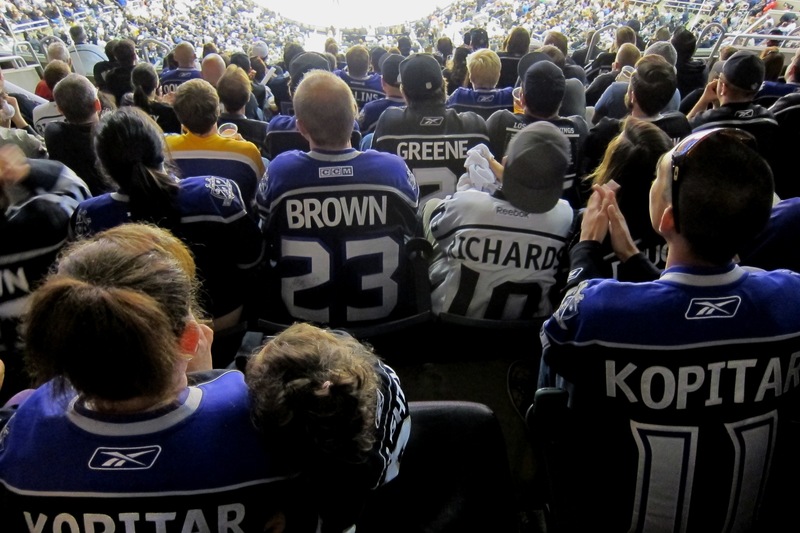 Well, except for the girl next to us who got drunk during the 1st intermission and passed out for the rest of the game. 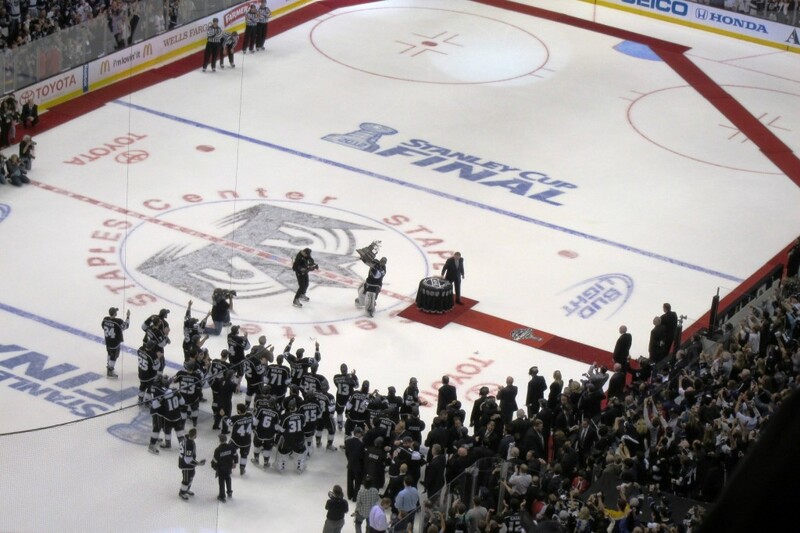 After they went ahead 5-1 with 4 minutes to go in the game, I rushed to the restroom, knowing that they had just won the cup and the celebrations would be long. I didn’t want to miss any of that. What I did miss was the 6th goal, while in the restroom. I run back to my seat to witness the last 2 minutes. The fans were going crazy. Some of them had waited 40+ years for this. The entire stadium started counting down: 10..9..8..7..6..5..4..3..2..1!!!!! It was something I will never forget. 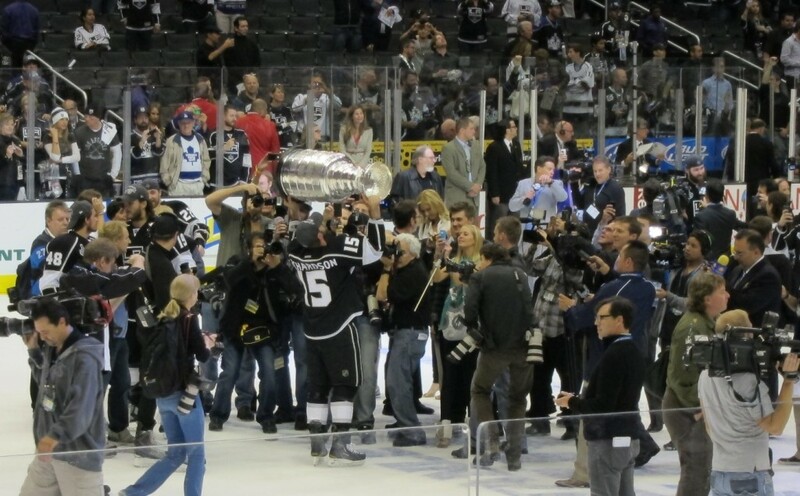 I had fantasized many times with captain Dustin Brown hoisting the Stanley Cup, and there I was, seeing it in person. We stayed there for a while watching the celebration on the ice. 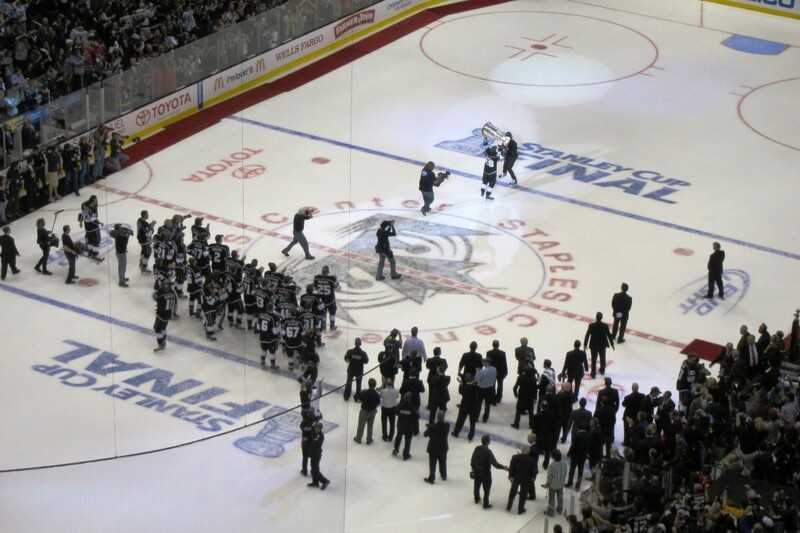 The players stayed there for over an hour, joined by their families and passing the cup around and around. 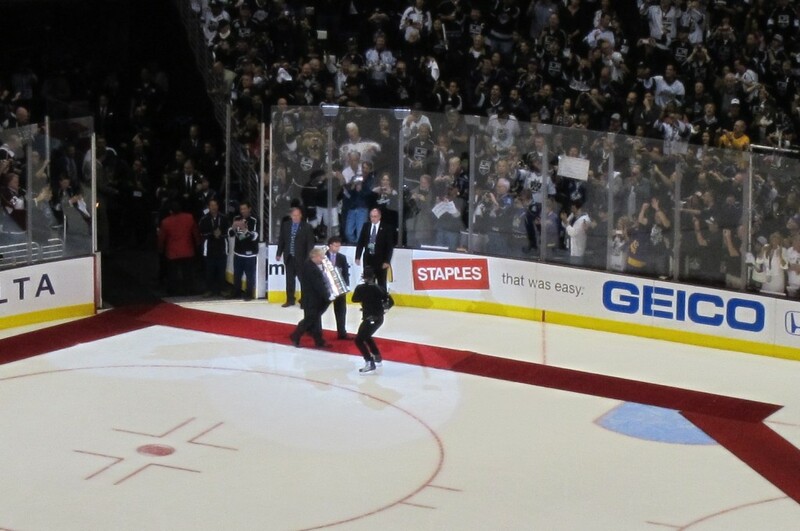 We were able to sneak into the lower level and get within a few feet from the glass.